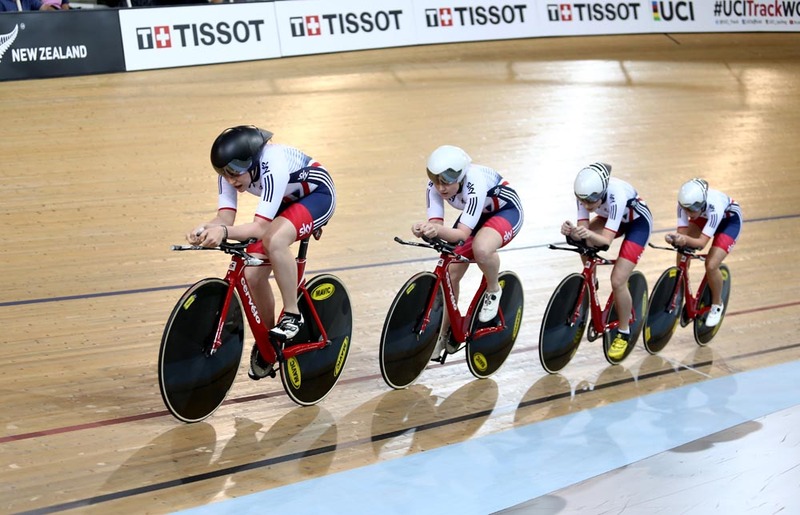 The youthful Great Britain endurance track squad has made a good start in the second round of the 2015/16 UCI Track World Cup in Cambridge, New Zealand. Both the men’s and women’s squads qualified to go through to round one of their respective competitions as they gain valuable experience at the top level of track racing. The men’s line-up of Chris Latham, Ollie Wood, Germain Burton and Mark Stewart clocked a 4-04.128 to qualify as seventh fastest, and will now face a ride against France. The Australian quartet of Jack Bobridge, Glenn O’Shea, Alexander Edmondson and Michael Hepburn were quickest with 3-56.403. Ed Clancy was due to make his return to international competition in New Zealand, but had to withdraw to undergo back surgery to correct a lingering injury. The British team of Emily Kay, Abigail Dentus, Manon Lloyd and Emily Nelson put in a time of 4-32.453 to qualify in eighth place behind fastest squad Canada, who managed 4-19.359. Britain’s sprint line-up featured much more experienced riders than the endurance squad, with men’s team sprinters Jason Kenny, Philip Hindes and Callum Skinner qualifying in fourth spot to progress to the bronze medal final against the Australian Jayco-AIS team. Jess Varnish and Katy Marchant didn’t fare so well in the women’s team sprint, qualifying in 11th place and missing out on the finals. The second day of action in New Zealand will see Chris Latham in the men’s omnium, Jason Kenny in the men’s keirin, Mark Stewart in the men’s scratch race, Becky James and Katy Marchant in the women’s sprint and Emily Kay in the women’s omnium.